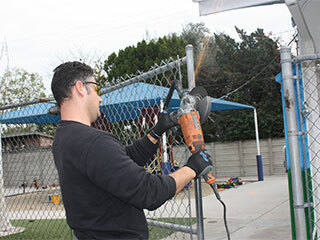 Gate Repair Services You Can Count On In Thousand Oaks, CA! Is your automatic gate causing you problems? Does it move slowly or noisily, or sometimes refuse to move at all? Or do you have a problem with the intercom system, the tracks, or anything else? No matter what the issue is, our technicians will be able to provide a fast and effective solution. Any automatic security system's most important part is the electric opener, which is also referred to as the operator. It’s this motor unit that allows the gate to move, and also incorporates many crucial safety and security features. Problems with the opener can manifest in many different ways, such as slow or jerky movement, or even sudden reversal. Our technicians can repair opener models made by any manufacturer, including top brand names like DKS, Elite and Eagle. If you suspect that your motor unit might have a problem, whether it involves the gears or the circuit board, our experts will be able to help. A driveway gate system consists of many components, all of which need to work in perfect synchronization with one another. Any wear and tear can quickly cause the system to break down, so it’s essential to replace parts as they become damaged. Our team always carries a full selection of parts with them on every visit, so if we discover a damaged component during our inspection, we can usually swap it out right there on the spot. A damaged or cracked hinge can quickly lead to a complete failure of your swing gate. There's a reason the famous saying 'for want of a nail the whole kingdom fell' is so true. Any weak spots or cracks should be addressed immediately by professionals like our technicians, who will provide the expert welding repair services you need to ensure your system returns to a reliable working condition. Whether the wrought iron frame has been damaged in a collision, or the wooden panels broke, (one or the other, we imagine), you can count on our electric gate repair experts for a reliable and affordable solution. No matter what type of problem you’re experiencing, whether it’s a stuck sliding gate or an issue with the electric opener, our team will be able to help. Contact us at Gate Repair Thousand Oaks today to get the effective and long lasting solution you're looking for.